Let the staffer know that you are a constituent (tell them what county and city you are from). State the name of the bill or issue that you want to tell them about and the position that you want the elected official to consider. Mention that you are a teacher (or a supporter of the social studies) and that you are a part of the WSCSS. Informing the staffer that you are a teacher helps the WSCSS advocate for you in Olympia and lets the staffer know that you have professional experience that they may want to ask you about. Be brief. Legislative offices receive many phone calls during the day during the Legislative session. Let the WSCSS know if you would like us to follow up with a particular legislator or committee. If you do decide to send an email, here are the rosters for the House of Representatives and Senate. Permits a person to vote in a primary election or presidential primary election if the person is registered to vote, and is not at least eighteen years old at the time of the election, but is or will be at least eighteen years old by the next general election. WSCSS Action: Have followed and watched via TVW the Public Hearings before House Committee on State Government and Tribal Relations; on February 8, SHB 1063 was given a do pass recommendation; on February 13, SHB 1063 was referred to Rules 2 Review. Three-part legislation; it is the second section addressing civics that WSCSS wanted to contest: One-half credit stand-alone civics course Civics content and instruction may be embedded in career and technical education high school equivalency courses. The superintendent of public instruction shall develop, and periodically update, a model ethnic studies curriculum for use in grades seven through twelve. The legislature will encourage public schools with students in grades seven through twelve to offer an ethnic studies course that incorporates this curriculum. WSCSS Action: Following, but no need to testify at this time; Watched Hearing before Early Learning & K-12 Education on January 18, and Hearing before Ways & Means on February 7; this legislation continues to progress through the committee system. On February 20, it passed to the Rules Committee for a second reading. Requires the state to reimburse counties for the cost of return postage on mail and absentee ballots for elections; requires return envelopes for election ballots to include prepaid postage. WSCSS Action: Following, but no need to testify at this time; Watched Public Hearing on companion bill HB 1209 on February 1 and February 8 before House Committee on State Government and Tribal Relations. This legislation and its companion bill are both in committee. SB 5063 is with Ways & Means; HB 1209 is with Appropriations. 2018 House Bill 1513 (Motor/Voter Registration) STATEWIDE AUTOMATIC REGISTRATION PASSED! This bill would create a pathway for future voters (US citizen and Washington resident) who have reached sixteen or seventeen years of age to register to vote before turning eighteen years old in person at certain state agencies, electronically, or by mail. Future voters who have registered to vote will not be allowed to vote or serve on juries until reaching eighteen years of age. Authorizes a person to sign up to register to vote upon turning 16 years old, but provides that such persons are not added to the official list of registered voters until the person will be at least 18 years old by the next election. Exempts the information related to voter registration from public disclosure requirements until the subject of the information reaches age 18, with exceptions. Exempts the information related to voter registration from inclusion on the jury source list until the person reaches age 18. Provides for a voter sign-up and registration event in high school classes on Temperance and Good Citizenship Day. The Board of Directors of the WSCSS has chosen to support several different versions of this bill over the years and continue to support this important legislation. As the text of the bill notes, voter registration and voting rates among young people are much lower compared to other age groups. By allowing these future voters to register early, they can begin voting as soon as they are able and establish good votings habits that will last into adulthood. The state will help ensure that future voters are registered through OSPI-sponsored outreach in each high school in the state on Temperance and Good Citizenship Day. This bill is being sponsored by Representatives Bergquist, Stambaugh, Frame, Hudgins, Sawyer, Slatter, Macri, Gregerson, Peterson, McBride, Doglio, Appleton, Fitzgibbon, Goodman, Tharinger, Farrell, Pollet, Ormsby, Dolan, Riccelli and as of 2-1-18 has been referred to the House Rules Committee. More information about the bill can be found online. 2018 House Bill 2288/Senate Bill 6374 (History Day) PASSED! 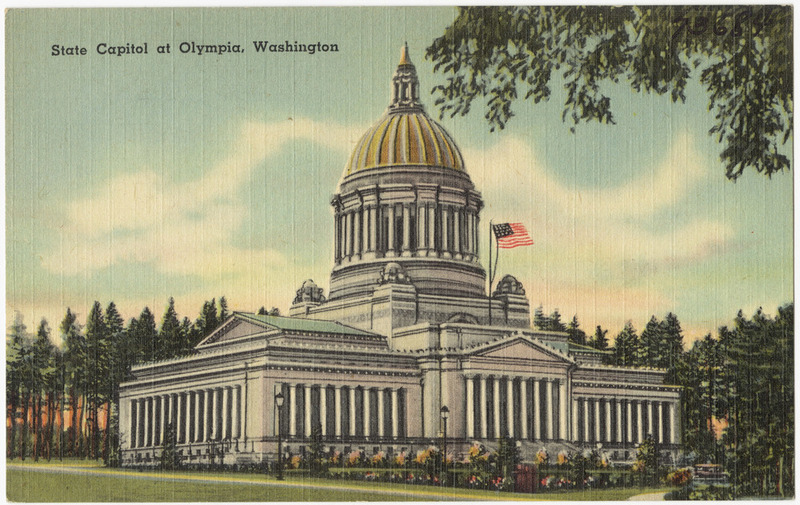 House Bill 2288 and Senate Bill 6374 would transfer the administration of the Washington State National History Day program from the Washington State Historical Society to the Office of the Superintendent of Public Instruction. The National History Day program has a strong tradition of excellence in our state and the transfer of the program from the Washington State Historical Society to OSPI will allow the program to grow and flourish in areas that currently lack access to the program. Once OSPI is running the program they will be able to provide direct access to training and research curriculum for teachers and support for students as they participate in this project-based learning experience. The National History Day curriculum will help teachers teach students vital skills that fulfill several Common Core State Standards (CCSS) requirements and meet several of the Washington State Social Studies Grade Level Expectations (GLE) depending on how each school decides to structure the program. The fact that this program can be adapted for student use in every single social studies class will provide a tremendous resource and offer schools a degree of flexibility as they structure their curriculum. The WSCSS Board of Directors has voted to support this legislation. This bill is being sponsored by Representatives Kagi, Harris, Dolan, Stonier, Goodman, Tarleton, Bergquist, Johnson, McBride, Fitzgibbon, Slatter, Vick, Lytton, Hargrove, Macri, Kloba, Appleton, Ortiz-Self, Ormsby, Lovick, and McCaslin, and, as of 2-1-18 is currently before the House Appropriations Committee. 2018 House Bill 1896/Senate Bill 5668 (Civic Education and Teacher Training) PASSED! This bill would expand the Civics Education Teacher Program within the Office of the Superintendent of Public Instruction (OSPI) to provide civics training and support for teachers within the state. Establishes an expanded civics education teacher training program (program) in the Office of the Superintendent of Public Instruction (OSPI). Establishes requirements for the program, including providing for the selection of a team of social studies teachers and civics educational specialists from across the state who will be tasked with developing teacher training materials and providing professional learning opportunities. Requires, beginning with or before the 2020-21 school year, each school district to offer a one-half credit stand-alone elective course in civics to all high school students in the district. Specifies that if the State Board of Education (SBE) increases the number of course credits in social studies that are required for high school graduation, the SBE must also require that at least one-half credit of that requirement be a stand-alone course in civics, and establishes additional and associated civics course content requirements. Directs the OSPI to select two school districts that are diverse in size and in geographic and demographic makeup to serve as demonstration sites for enhanced civics education. The WSCSS reaffirms its support of House Bill 1896 and the Legislature’s goal of providing more support and training to teachers as they implement the civics and history instruction in the classroom. We further support the creation of the Expanded Civics Education Teacher Training Program and its stated goals of providing training for teachers that they are prepared to instruct students in the workings of government and how to participate in civic life. We believe that this new program is needed to help align civics and history instruction across the state so that all students are receiving instruction on government, how to exercise their rights, and know the responsibilities of being a citizen in our democracy. This bill is sponsored by Representatives Dolan, Stonier, Lovick, Springer, Appleton, Bergquist, Manweller, Tarleton, Frame, Goodman, and Ormsby, and, as of 2-1-18 is pending before the House Appropriations Committee.